WWHM4 is the newest release of the popular Continuous Simulation Stormwater Modeling software WWHM. 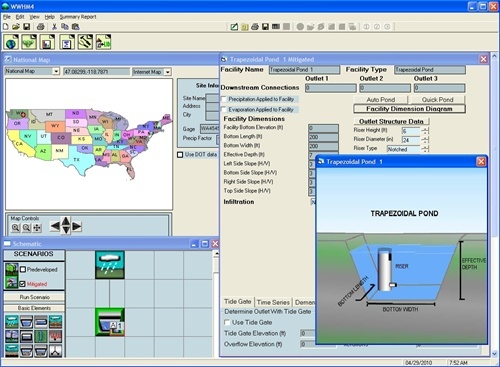 This software includes powerful tools to help Stormwater Engineers meet the stricter standards for Environmental Protection. User may install software on one workstation. Activation is required prior to use. WWHM4 offers many exciting new features. National Timeseries data included for models anywhere in the Contiguous United States. HSPF and SWMM fully integrated in one model. Nine (9) LID elements - easily autosize LID units like Inground Planter Boxes. New Elements for Porus Pavement, Bioretention Swale, Green Roofs, Hydraulics, etc. Enhanced Stage Storage Discharge Element for multilayer ponds. Improved Graphing and Reporting tools. New WDM Maintenance utility for managing timeseries data in WDM files. Workstation, Server, and Network Licensing available. Review Checklist automates and assists in the project review process. Full and Reviewer (limited editing) editions available. Compatible with previous versions of WWHM. Prerelease purchases will be available soon. Please contact us at 866-943-0304 to inquire.